If you live in the Colborne Way area, please keep an eye out for Emma the tortoise who escaped from a back garden in Colborne Way on Sunday (28th July). Emma is a much loved Child’s pet and has been part of the family for a great many years. There is a reward offered for Emma’s safe return. Please contact Tony on 07788 113 843. My grandparents had a tortoise so this brings back memories for me. They had their address painted on its shell as it used to escape from their garden quite often and was always brought back by kindly neighbours who knew immediately where it had come from. Emma has been found by someone in Buckland Way! I have contacted the person who contacted me with their contact information. Thanks everyone for going into 'tortoise vigil' mode. Stand down now. Emma has not yet been found. 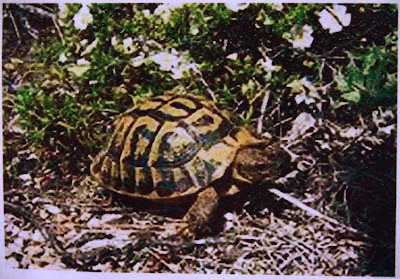 Two tortoises have apparently gone missing at about the same time and it was the other one which was found. Glad that one has been found but Emma is still missing.